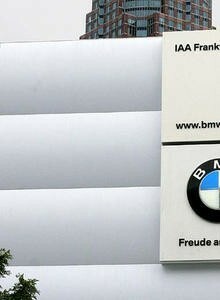 BMW's motto for the IAA 2005 was "BMW. The driving force." The large BMW Pavilion on the Agora had a surface area of some 3,400 square metres and has an air PES/PVC membrane façade: cushion areas measuring 2 x 15 metres, kept under constant pressure by a compressor, encase the translucent construction.